I’m embarrassed to say that I’m finally getting the last of the random pieces of Christmas put away. A month or so ago, the Christmas decorations were unceremoniously stashed into a heap in the basement. ‘Out of sight; out of mind’ allowed me to procrastinate even further. Finally, however, everything is organized and stacked in passably neat boxes in the corner of the basement. The only thing left is a pile of Christmas cards, which are actually still on the mantel. 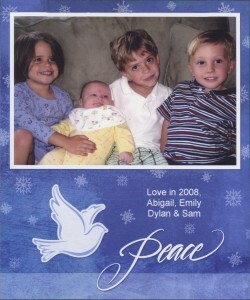 I guess the cards linger because the real tradition I cling to is the Christmas card. Those memories go as far back as I can remember. There are people who have received a card from my mother every year since I was born. And it’s always been a photo card. Thankfully, she’s finally released my sister and me from being the stars of the card. We owe her relinquishment to our children, who now occupy center space on the family photo cards. I must admit to having ambivalent memories of taking the Christmas card picture as a kid, especially in our teen years. If I could get my older sister to chime in on this one, we’d probably go on way too long. Although we often took the picture on Thanksgiving, if there was an early Pennsylvania snow, we knew it would mean bundling up and getting our smiles and knitted grandmother sweaters on before the heavy, wet snow fell off the pine trees. 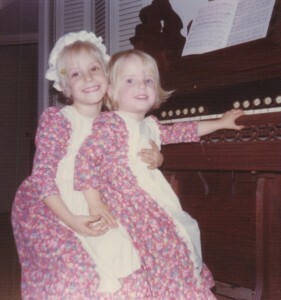 We’d pose for frame after frame depicting tender and joyful sisterly love. Portrait of the perfect family. Isn’t that what the holiday card is all about? 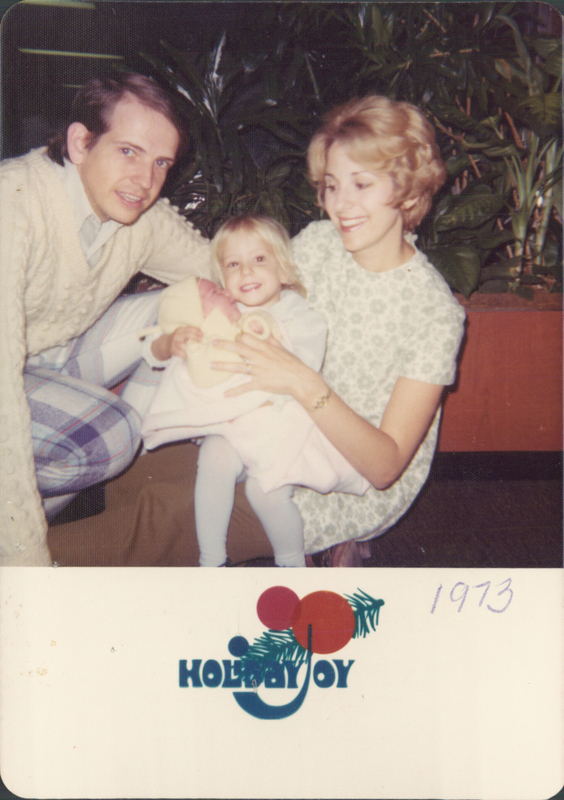 I don’t think it’s necessary to hash up the past, and I know my mother may be saddened to see this in writing, but there was nothing that would crush the holiday spirit more quickly than the hassle of trying to take that Christmas card picture. After shooting a full roll, we’d rush over to the store to get it developed and hope for the best. There were no digital pictures back then, so we would have to wait days before learning if the shot was Christmas card worthy. A fake smile, double chin, closed eye, or the accidental arrangement of a telephone pole would mean starting back at square one. Of course, technology moved us forward, though sometimes not in a good way. 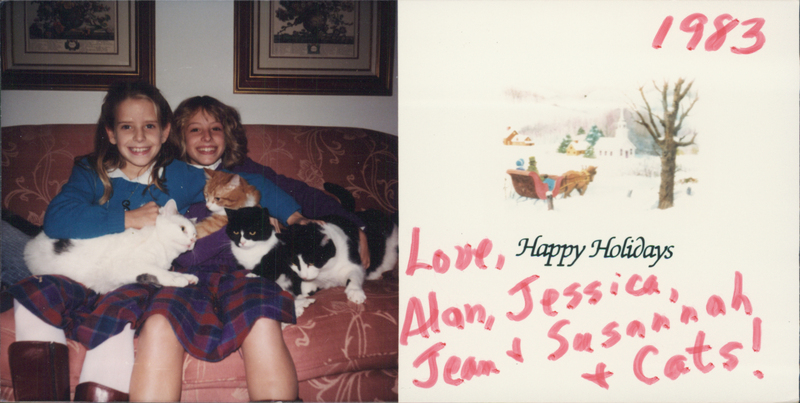 I remember a particularly weak card one year where we actually photoshopped in my sister. Unfortunately, the technology just wasn’t quite where it needed to be. Today, however, as I now have children of my own and have continued my mother’s tradition of sending photo cards that chronicle Dylan’s and Abigail’s lives, I see a different side of it all. Christmas cards are a perfect platform to keep connected with friends that you may not have seen in years. It’s an active way of saying, “I still think of you.” It stands in high contrast to the way in which we have all become voyeurs to the lives of practical strangers on networks like Facebook where our ‘friends’ number in the high three and even four digits. Tom-foolery: our way of rebelling against the dreaded "Christmas card photo"
Yeah, it’s mostly just the good news. Although there is sad news that can’t be sugar-coated or avoided. Christmas cards force me to face the heartbreak. One card we received shared the tragic news of a life-changing injury sustained by a dear friend’s husband while serving in Iraq a few years ago, explaining why we had not heard from the couple in a several years. They’re just now starting to send cards again. Another card we sent, addressed to a couple, was answered with a phone call sharing the sudden loss of a husband this past summer. And the sadness can’t be more poignant each year when we see a little halo over the name of a friend’s baby who died of SIDS five years ago. And there’s the unavoidable news of name and address changes brought on by divorces. My husband claims I have more divorced friends than anyone he knows. I’m not sure about that, but I do know that each year, there are one or two new splits to add to the list. Of course, there are other couples where we are more surprised to see that they are still together year after year. It does make me wonder sometimes what bets are placed on my husband and me. . . . 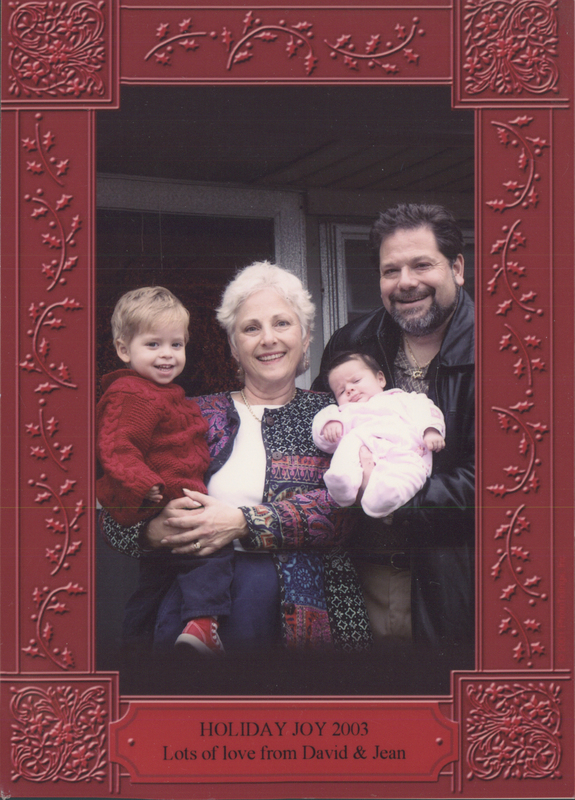 Mom Finds New Subjects: The Grandkids! So for me, it’s not a bragging letter, the picture, or the foil-lined envelopes. Instead it’s the poignant moments that come when I’m going through the list in January, editing and updating. I sort through the envelopes, updating and correcting my list. I remember my mother doing the same, though with the advancement of technology, I do it a little differently. She had a flowered address book, with addresses written in pencil so new addresses and changed names could be easily edited. Albeit impersonal, I now I use an Excel spreadsheet. As streamlined as my system is, it begs the question of what to do when someone dies. For my mother, when someone died, she’d just put ‘dec.’ and the date. She never erased a name. But since I use the spreadsheet, instead of a little note by the name like my mom did, I delete the deceased spouse, making it ‘address ready.’ This year, I was overcome with the harshness of it all. So for 2012, I added a few babies, changed a handful of addresses, inserted a few rows to accommodate where one household had become two, and added a Mr. & Mrs. to a few lines. But the hardest change was when I deleted my Aunt Amy’s name last week, who succumbed to cancer a few months back. Though I’ll continue to send a card to her partner, her own name was now gone from my list. No pencil mark “dec. 10/26/11” like I remember seeing in my mother’s tattered Christmas address book. Although I know the feelings of loss and change are still the same, at that moment, the process felt overcome by mechanization. Maybe that’s why my cards are still on the mantel in the little snowman card holder my kids made for me. And I guess I’ll keep them there as long as it takes to shed those tears that still seem to come out of nowhere when I think of Aunt Amy, and that will eventually be tempered by remembering all the fun times with her and her consistently artistic and ‘laugh out loud’ funny photo Christmas cards. And I’ve decided to make some changes on my Excel spreadsheet Christmas card list, too. Instead of deleting grandparents and favorite aunts’ names, I’m going to insert a column, right after the address. I’ll simply cut and paste each lost loved one’s name to this new column, and label it “dec.” at the top, as a nod to my own mother’s wise ways. I’ll also try to find more balance —the more technology that’s available, the more my life is convenient and streamlined. But with these advancements comes the need to guard against being overcome with the soullessness of it all. No technology can ever fill the void left when that last Christmas card from a loved one is opened. In fact, with all the scientific advancements, we still can’t predict just when it will be that last card. Maybe that’s why the cards linger on the mantel. I have a need to hold onto something more tangible than an Excel spreadsheet on a blinking screen. Instead I have the smiling photo cards, the sweet handwritten signatures of small children, and the understanding at last of the necessity, on some level, to preserve a “perfect” past. It helps us cope, you see, with a sometimes imperfect present where heartbreak is real. This was a wonderful piece! I kept hanging on to the email until I really had time to read it. In two short-years, I’ll be a “housewife” again. I just can’t wait. I want to have time again–time, to read, write, sew, give back and most of all, praise God for all He’s given me. Thanks for sharing. Your stuff makes me tear- up and laugh all at the same time.